So I love your blog! We just got a mini pig named Olive! She is so sweet and smart. However we let her sleep in the play pen ( I got the same one that you got) and the urine smell is starting to go in the house. I use the same products you do but I don’t know what I am doing wrong. She is just a little over a month so I know she can’t hold her bladder and she is learning to go on doggy training pads, but any suggestions to get rid of the smell from the pen? Thanks! How much did Oscar grow in inches? The best method I have found for removing the urine smell and stain was to saturate the area with apple cider vinegar and scrub it well (for stains I added a sprinkle of baking soda). I removed as much of the vinegar as I could with a towel and then allowed the sun to dry it completely. The combination of the vinegar and uv rays worked amazing. The best way to avoid a strong urine smell in your house is feed them yucca root. Take the waxy outside off and cut in very small pieces and give them 5 or 6 a day and their urine will lose its smell completely. I fed it to Louie every day and when I cleaned up urine I could put the towel next to my nose and it smelled like water. In other words had no scent at all. Hi Mattie! Whether a mini pig is worth it will be different for each person. I love Oscar and find him very rewarding as a pet, but mini pigs are also really challenging pets. They are adorable of course, and they are funny and curious and entertaining which makes them great. Some of them are really cuddly, and that’s such a nice feeling. That being said, Oscar takes up a lot of my time and energy. To compare, Oscar is much more challenging to care for than my dog. He is more emotionally needy and simply requires more of my attention in order to be a good pet. If you and your grandma have the time to put into making a mini pig a good pet, you will probably enjoy being a pig parent. On the flip side, mini pigs who are left alone a lot or don’t get enough attention can become destructive, so it’s important to make sure you can keep them entertained and stimulated. I definitely don’t want to discourage you because I have had a positive experience with Oscar overall, but I do want to be honest about how challenging he has been and how much of my time and energy he requires. My main recommendation is to do a ton of research. Read as many articles as you can about mini pigs and really be honest with yourself about the day-to-day of living with a mini pig. I will list a few posts below from our site that I think will get you started. Pigs are amazing animals and can make wonderful pets, but it’s important to make sure you know what you’re getting when you decide to bring one home. Here are some posts that I think will help you in your decision. I am so so happy to have found your blog! We have put a deposit down on a mini pig and I needed to know so much! I’m completely used to raising puppies and kittens, but not yet pigs. So, I wanted you to know that you are helping me and I’m sure many others 🙂 So, thank you!! Oscar is so darn cute !! What is the best thing to bath your pig with? Hi Mandy! I’m not sure what the best thing is technically, but we just use regular baby shampoo and have been really happy with it so far. Okay I have a 1 year old micro mini pig that is about 40 lbs. She is a mess and loves to tear up every bed I get her! I bought her a Kong brand bed because they were recommended to be the strongest bed…sorry Kong but not my little Libby lol. I was wondering if you have the same problem with your piggy. Also I use a small storage container with pine pellets for Libby to use as her litter pan. I believe that she thinks that it is not only used for her potty but as a toy as well because she roots all of the pine pellets out of her box and onto my floor. Those are the days that she does not get treats lol. She is spoiled rotten and I love her to death but I was just looking on some advice from one piggy parent to another. Thanks. Hi Meredith! Your comment gave me a bit of a laugh just because Libby sounds very creative! That being said, I’m sure it’s super frustrating when she tears up all of her beds and spreads her pine pellets all over the floor. That would be adorable once or twice and then get old pretty quickly…haha. It’s unfortunately really hard to train pigs out of these behaviors because they are so stubborn. We had a problem for a while with Oscar rooting on some new rugs we bought. He was rooting on them, biting them, and trying to tear up the fibers…constantly. No matter what I did, I couldn’t get him away from the rugs. I finally got frustrated and took him outside and let him root for as long as he wanted, and he came in so tired that he left the rugs alone for the rest of the day. When it’s nice outside, I give him at least 30-60 minutes outside in the mornings to root around, and then he’s usually super well behaved the rest of the day. My point is just that, rather than trying to get her to stop the specific behaviors, you might try wearing her out by making sure she has enough time to root or play with toys that stimulate her and get her energy out. It might not be possible every day, of course, but the more you can do that, I think the less you’ll see some of the more destructive behaviors. Rooting outside is the easiest because she’ll likely keep herself entertained with rooting since it’s so natural (I go out with Oscar to keep an eye on him and use that time to check things on my phone or respond to emails or something like that…), but you can also do it with food-dispensing toys and there are some on our Toys for Mini Pigs post (http://lifewithaminipig.com/toys-for-mini-pigs/) that she might like. But, I would give one of those things a try and see if it keeps her stimulated and worn down enough that she isn’t interested in tearing things up that you don’t want her to. Hope that helps! I am having an issue with my mini pig placing his blanket in his water bowl. I’ve even moved his water bowl and he still seems to find it to put his blanket in it. He also will put his blanket in his litter box. Hi Chea! You’ve totally stumped me on this one! Oscar absolutely hates water, so he keeps away from water at all costs. A thought would initially be that maybe he’s trying to cool himself down, but that doesn’t seem very likely. Or, in that case, I could see him trying to get in the water rather than putting his blanket in there. Are his sleeping area, litter area, and drinking area far enough apart? Does he have enough to play with or is he doing this to entertain himself? Sorry I’m not much help on this one! I would love to hear from anyone else who’s dealt with this because I’m totally stumped on why he would put his blanket in his water dish and litter box. We have my mini, Homer, in our spare bathroom. It is a smaller area but we have everything spaced out. Meaning water and food on one side, his bathroom on the other. A small kennel to sleep in. We have a soccer ball in there and also a tub with rocks to root in. Maybe he is just a little silly. -Thanks! We just got our first little piggie, Mango, and she is so sweet! But she is very timid. It has been a month and she still squeals at times. What can we do to socialize her? We have followed all instructions, she has her own room but during the day the door is open. We spend time with her in her room and out. Maybe I am pushing it but I expected by now she would be further along. I am just wanting her to be comfortable and feel loved. Hi Ani! I would just keep at what you’re doing. It sounds like you’re doing everything you can, and it can just take them a long time to start trusting. Your experience is similar to what we went through with Oscar, and it’s all just a very gradual process. Hopefully you’ll start seeing more and more progress as time goes on, but it was probably several months before we felt Oscar was really getting comfortable at home. Hang in there! This can be a really frustrating time, but it gets better! Hi! I agree with everyone else this was SUPER helpful! The sad thing is I don’t have a mini pig of my own. I am trying to convince my parents to lets me get one but they wont budge. One of their biggest reasons is the smell. Do you have any foolproof product that I could show them and help convince them? Any help would be greatly appreciated! I have 2 mini pigs, Barbie-Q and Pippy. They can be a handful at times but they are the highlight of my day every single day. As an experienced pig owner… Aside from all of the great info already provided… If u get one and plan to get another at a later time… Beware. We have had a heck of a time getting Barbie and Pippy used to each other. I have the wounds to prove it! Barbie is very territorial and jealous of her mommy and daddy. So we have to watch them close.Pippy is a rescue so she is much smaller than Barbie. Her original owners only fed her celery and carrots. This IS NOT healthy for them. It stunts their growth by compromising their skeletal system. Please read up on what to feed them! Thanks for the great info! This has been so useful! I’ve been assuming we will leave our mini in a kennel/ crate while we are at work, just like we do for our dog. 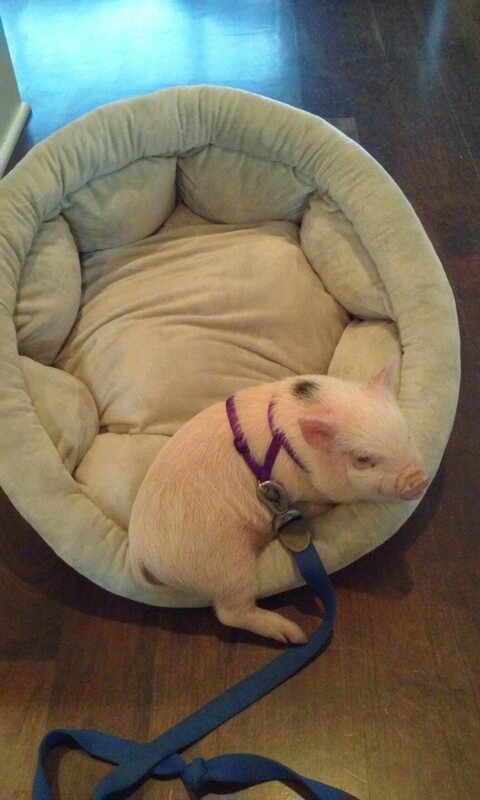 Do you feel that will be okay, or will be pig be overly bored in the small space? I have mini pig. Are they an inside pig or an outside pig? Also what else do they eat beside pig pellets? As you can see this is my first time having a pig. Lastly, can they stand the heat? Thank you! Just want to say I love your blogs and they have been extremely helpful! We are going to be pig owners pretty soon and your blog is getting us prepared for everything, I’ve got a big list already of things we will need, getting so excited!! Ps Oscar is just about the cutest thing!! Keep the blog going! HI! So much great info, thanks for this blog! I have a mini, eight months old. Just made her, her own area outside with white picket fence, dog house etc, etc. for her to play during the day. Question I got her a little pool so she can keep cool, but it seems she is peeing in it. Anyway to stop this? Lastly, any deterrent you know of to help keep her away from certain plants? Thank you soooo much! Where do you think the best place to adopt a pig? where do you think would be a dest place to get a baby pig?